I have fond memories of when I would stay at Nan & Pop's place as a child. A weekend or school holiday visit guaranteed me time with Nan in the kitchen. Some of my all time favourite cooking experiences included cooking batches of scones, golden syrup dumplings, date and walnut slice and pancakes with Nan. Pancakes were made the morning after a sleep over at Nan's and I remember Pop sitting up reading the paper as Nan and I whipped up a batch in the kitchen. Nan has always had gas cooking and I always looked forward to lighting the gas jet and waiting for the knob of butter to sizzle and bubble up before we poured in our first 'test' pancake. The first one was always the test one and of course I got to sample it everytime - for quality assurance of course! 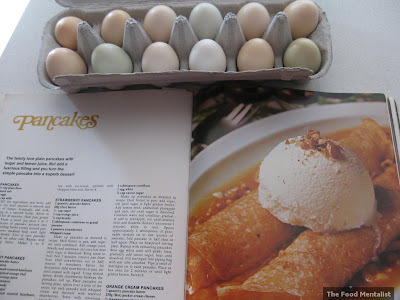 The reason I call this recipe the 'Best Ever' pancake recipe is because it comes from the Women's Weekly Best Ever Recipes Cookbook - the one with the roast chicken and piped mashed potato on the cover. It's also the best recipe because it's the one Nan and I followed. As far as pancakes go, this recipe produces a much thinner pancake - it's almost crepe like. I love it because it is rather light and you can have a few without feeling bloated and full of that 'traditional' pancake 'fluff', so to speak. When we were cooking these pancakes Nan and I would eagerly wait to flip over the pancake hoping (a) it was nicely golden underneath and (b) that we flipped it perfectly. Following this we would do a little dance move, picture the twist - side to side. Whilst our dance was only brief, it was really fun. It made cooking fun and enjoyable. Once cooked, we would place each one on a plate in the oven on a low heat and separate each one with a piece of greaseproof paper. It didn't take long before we had finished the batter and we would be ready to serve. I loved mine with lashings of butter and honey. Sometimes I would have them with butter and one of Nan's jams. Nan & Pop would have theirs with lemon and sugar. I grew up thinking that was the 'adult' way to have pancakes. I realised later that this old fashioned flavour combination was indeed - Perfect. 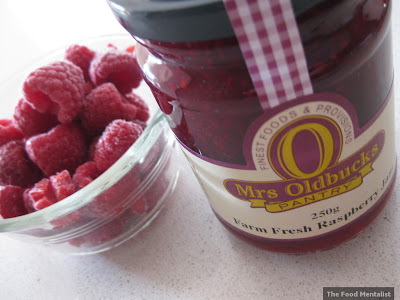 On a recent trip to the Southern Highlands, Pete and I visited Mrs Oldbucks Pantry in Berrima where I purchased some delicious raspberry jam. I decided it would go perfect with this recipe as a sauce. Also I wanted to use the fresh farm eggs we picked up 2 km inland from Berrima following signs from the main road. They were available to purchase through a honour system where you leave your money in a jar and take your dozen eggs from an esky underneath. They were bantam eggs - all white and a lot smaller than the usual larger brown eggs we are all used to. Did you know that white eggs only come from white feathered hens? The pancakes were so yellow due to the fresh eggs, yum! Sift dry ingredients into bowl, add eggs, stir until mixture is mooth and free of lumps. Gradually add milk, mixing to a smooth batter. Allow to stand for 30 minutes. Heat pan, grease well. From a small jug pour 2 to 3 tablespoons of mixture into pan, sqwirling batter evenly around pan. Cook over medium heat until light golden brown. Toss or turn pancake and cook on other side. 1 small handful of fresh or frozen raspberries. Place the berries and 3-4 tablespoons of jam in a small saucepan and gently heat through. Once the jam has melted down add the boiled water and bring to a gentle simmer. Voila! Spoon approximately 2 tablespoons of the hot raspberry sauce in each pancake making sure to include some of the fruit. Next, gently roll each pancake to form loose cigars. Spoon over some more sauce and enjoy! Tell me, what are some of your favourite childhood cooking memories? I've been wanting a thin, light pancake recipe for ages. Thanks so much. My favorite cooking experiences were with my mother. 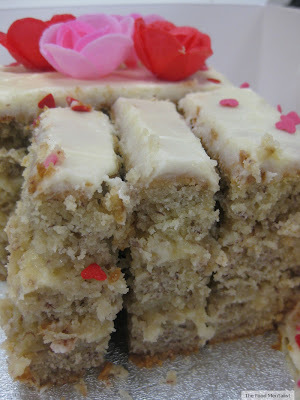 I loved helping with my mums walnut cake. And the best bit was licking the bowl!!!!! 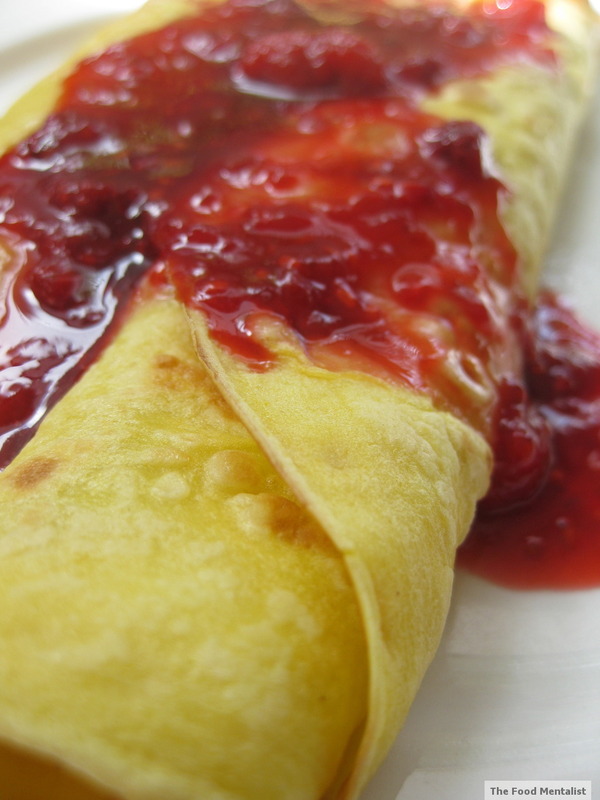 I love crepes, we used to fill ours with vanilla ricotta and stewed apples, but the jam combination sounds great too! My nan taught me how to cook too. When ever I came to stay there was always a cupboard full of baking ingredients, all I had to do was go through the recipe books to find what I wanted to make. BTW, We had the same cook book with the piped potato too! GG, Nan's are so great! And don't you just love this book?! Johanna, I like that idea sounds like a lot of fun, something kids would love! Hi there, my mum used to make lovely pancakes! Yours look very yummy.